What is Tungsten Alloy Armor Piercing APFSDS? 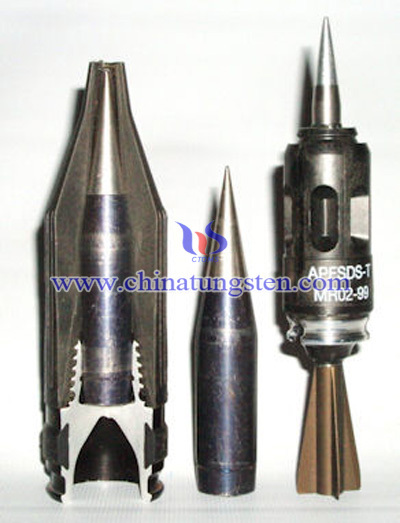 Tungsten alloy armor piercing fin stabilized discarding sabot (APFSDS) is a type of ammunition which, like a bullet, does not contain explosives and uses kinetic energy to penetrate the target. The term can apply to any type of armor-piercing shot but typically refers to a modern type of armor piercing weapon, the tungsten alloy armo piercing fin stabilized discarding sabot, a type of long-rod penetrator (LRP), and not to small arms bullets. The principle of tungsten alloy armor piercing is that it uses tungsten alloy armor piercing kinetic energy, which is a function of mass and velocity, to force its way through armor. The modern KE weapon maximizes KE and minimizes the area over which it is delivered by: maximizing the mass of whatever (albeit small) volume is occupied by the projectile—that is, using the densest metals practical, which is one of the reasons depleted uranium is often used, being fired with a very high muzzle velocity, concentrating the force in a small impact area while still retaining a relatively large mass. Tungsten alloy has so many advantages: high density with small volume, high radiation resistance, non-toxic and environmentally friendly, excellent hardness, high melting point, etc. So it is widely used as the materials of military weapons such as tungsten alloy bullet, tungsten alloy armor and shells, tungsten alloy shrapnel head, tungsten alloy grenade, tungsten alloy hunting gun, tungsten alloy bullet warheads, tungsten alloy bulletproof vehicles, tungsten alloy tank panzers, tungsten alloy cannons, tungsten alloy armor piercing, firearms, etc. Tungsten alloy can be used as the component in the kinetic energy penetrator . Chinatungsten Online can provide tungsten alloy armorpiercing fin stabilized discarding sabot used in kinetic energy penetrator. Apart form, we can also offer other tungsten alloy military components in strictly according to your requirements. if you have any interest in tungsten alloy armor piercing, please feel free to contact us by email: sales@chinatungsten.com or by phone: 86 592 5129696.